Nigel is back and finally finished! 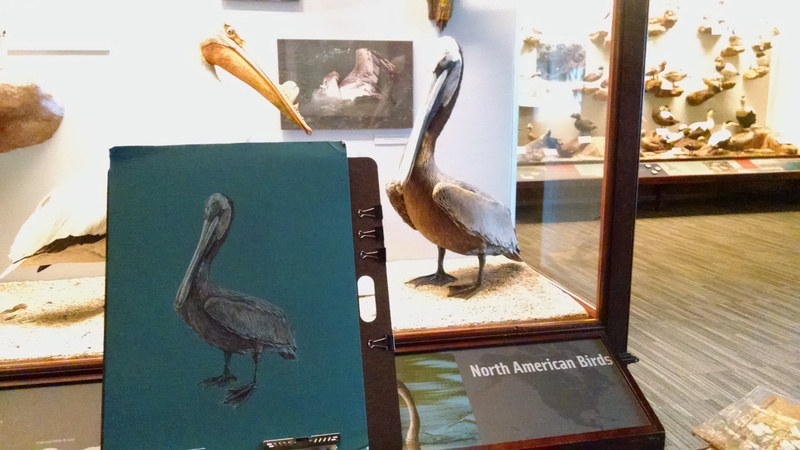 In my last post about the brown pelican, Nigel (yes, after the pelican from Finding Nemo), I wrote about how I started to create this illustration: drawing the outline, shading and color decisions, and starting detail. This post touches on the rest of detail and making decisions about whether or not to add extra bold details using a different media (ink) which is different from the main illustration. Below, is where I left off on the last post. I finished up the face, head and neck and started a light coat of color on the rest of the body and feet. Nigel with head and neck completed. Light color on the rest of the body and feet. A month ago, I met with all my other fellow artists from the Artist at the field group and decided to spend the entire day at the museum to finish this illustration. Um, just for people who are not from Chicago, the month of February was free month at the Field Museum. It was just a tad crowded! So, I started adding my shadows and blending the colors for the back and wing. What is nice about doing the feathers on a water bound bird is that they are matted down; that means, they are not fluffy and you cannot see nor distinguish the individual feathers on the body. I am in heaven just thinking about it. What you do see are the patterns and the color breaks. This is basically where I started on that busy Saturday. Adding the color breaks which are the shadows and lighter areas of the plumage. The start of adding color to the belly. Layering more colors to create the shadows. More color added adds more depth to the feather texture. Light colors are added to the belly to enhance the feather texture. The first part of adding shadows plays like a slow song; you have a slow and mellow beginning, a building of suspense in the middle, and a big crescendo in the end. So for the pelican, I first added the base color which is the layer you want to see through the entire area. Then, I started to add more reflective colors that will compliment the base color which enhances the detail which was the final layer added. Now, on to Nigel’s back. Using all the same techniques and procedures, I went through and finished the pelican’s back and then proceeded the finish the wing. Back is finished after using the same techniques as on the belly. First layer of color on the wing. More layers of dark and light colors on the wing. Once I had the all the color done on the body, it was time to start on the feet. I was one my way home with this one as I added more and more color to the webbed little feet. Knowing that I had just two feet left made me feel elated at getting the colored pencil part of the piece finished on that Saturday. More darks and lights added. Finished detail on the feet. So, as I finished the feet I realized this is it. 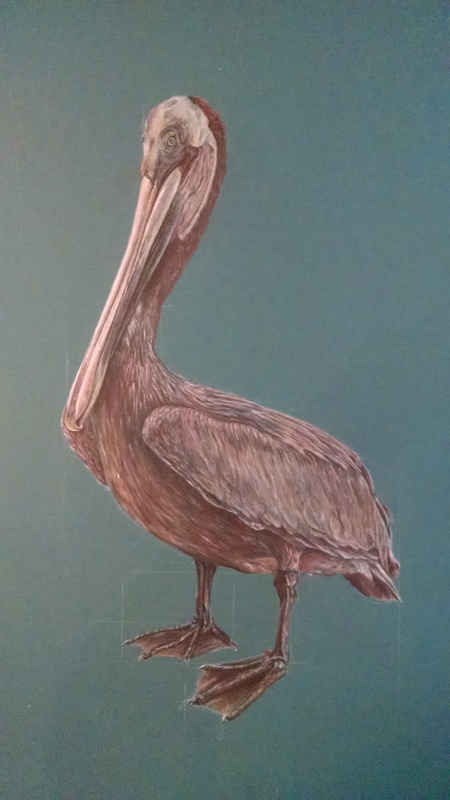 Nigel, the brown pelican is done! Finished piece next to the mount at the museum. Until my next post, CHEERS everyone!